You know the saying “You are what you eat”. It is literally true. Pain often results from inflammation, and inflammation can result from too many pro-inflammatory foods and not enough ant-inflammatory ones. Following the tips on this info sheet will help you maintain the right balance. To make the most of your energy peaks and minimize the limitations of the valleys, you will need to be strategic about how you eat. Here are the dietary strategies you’ll want to use. Do you have at least one bowel movement daily? Is passing gas a rare thing for you? The next section will introduce you to the basics of good nutrition, and the questions that determine how you are doing. Your goal is to be able to answer “Yes!” to all of them. If you give this diet a chance, you may be surprised by how much better you feel in as little as three weeks. Eat a variety of fresh, whole foods most of the time. Foods provide the greatest nutrient value when they are fresh. Canned and processed foods provide fewer nutrients, along with other undesirable ingredients. Frozen foods provide a nutrient level that is midway between fresh and processed. The healthiest foods will always be fresh items that you prepare for yourself. Eat plant-based foods more than anything else. Nutrition is chemically complex. While we have identified many biologically active and health-supporting chemicals in food, we haven’t found them all nor do we understand how they work together to influence health. Plants provide vitamins, minerals, carbohydrates, proteins, fats and a host of other nutritionally important components in ratios that are perfect for our health. These nutrient packages cannot be replicated with supplements. Enjoy your food but treat it as fuel. The heightened availability of dietary information has fostered much anxiety and many misconceptions. People worry about eating too much of this and not enough of that. The bottom line is this: Food is meant to be enjoyed. Enjoy what you eat, eat a wide variety of foods, and eat modest portions. Viewing your food as fuel means that you make conscious decisions to select high quality foods in the amounts that you need. Learn to recognize and respect your body’s cues to hunger and satiety. Have some protein at each meal. Protein, like carbohydrates, provides 4 calories per gram. Unlike carbohydrates, it is digested slowly and helps to keep blood sugar stable. Blood sugar spikes and the corresponding insulin peaks they produce, contribute the development of metabolic dysfunction and inflammation in your body. Having some protein with each meal helps to keep your blood sugar level and your energy high throughout the day. Eat regularly – do not skip meals. This principle also addresses the concern about stabilizing blood sugar. When you skip meals, your metabolism slows to conserve energy. Your body “thinks” it’s starving. With the next meal comes a flood of blood sugar, which triggers an insulin spike. Frequent small meals keep your body supplied with a steady stream of fuel. It doesn’t go into starvation mode. If you must fast or skip a meal, make your first meal after your fast a small one that includes some protein to prevent sugar-flood/insulin-spike reaction from occurring. Ensure your diet includes: sufficient water, probiotics and fiber. Your body uses water in most of its millions of chemical reactions every day. Staying hydrated keeps your metabolism running smoothly. Probiotics are bacterial that are normally found in our digestive systems. They are commensal organisms, meaning we provide them with a living environment in return for which they help to keep us healthy. You’ll learn more about the importance of these helpful bacteria in the Focus on Probiotics, but for now, make a mental note to include a source of probiotics, such as yogurt, kefir or sauerkraut, in your diet every day. 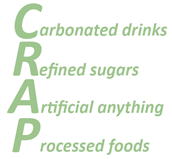 CRAP is an acronym which stands for Carbonated drinks, Refined sugar, Artificial sweeteners and colours, Processed foods. Simpler yet, just avoid anything artificial and packaged. You’ve heard a lot about fiber in the news, in magazines and on TV. You know it’s important to get enough, but how much, exactly, is that? The good news is that if you eat a diet that is 75% plant-based, you will probably get enough without ever thinking about it.